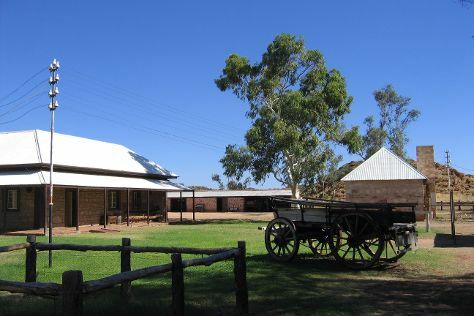 Step out of Alice Springs with an excursion to Hermannsburg Historic Precinct in Hermannsburg--about 2 hours away. Spend the 23rd (Tue) wandering through the wild on a nature and wildlife tour. Spend the 29th (Mon) exploring nature at Owen Springs Reserve. There's lots more to do: contemplate the long history of Alice Springs Telegraph Station Historical Reserve, look for all kinds of wild species at The Kangaroo Sanctuary, see the interesting displays at Road Transport Hall of Fame, and take in nature's colorful creations at Olive Pink Botanic Garden. For photos, traveler tips, where to stay, and tourist information, read Alice Springs trip itinerary builder website . In April in Alice Springs, expect temperatures between 34°C during the day and 15°C at night. Wrap up your sightseeing on the 4th (Sat) early enough to travel back home.